Conveniently located unit attached to owner's house. 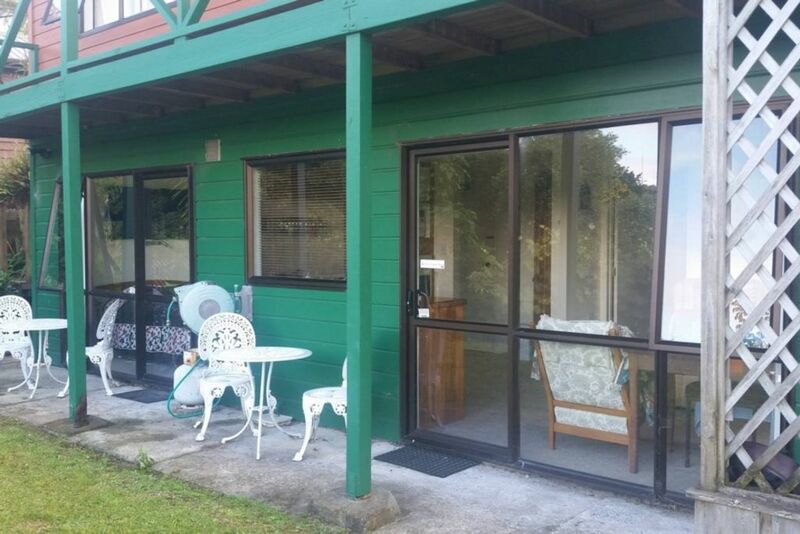 Under 10 minutes walk to the beach and town centre. Only one minute from the estuary and coastal bush walks. Raglan is known for its restaurants, cafes and shops as well as many outdoor pursuits. Whether you are wanting to relax and unwind or are looking for something more active, Raglan has what you need. You could try out the world famous left hand break surf beach, Manu Bay, get in a round of golf, sneak off fishing or take in the beautiful landscape by foot, horseback or bike or even kayak the waters of the harbour. Children are well catered for also with a large beach and impressive playground close to the heart of the town. Please note the property is not fully fenced yet. Off street parking is available down a steep concrete driveway. On street parking is also available. All linen and bedding is supplied for you to make your beds up when you arrive. No sleeping bags permitted. Limited Wifi available for essential matters only. Downloading of movies is not permitted. WiFi access will be withdrawn if guest use is excessive. Parking available down steep concrete driveway. Free street parking also available. Unit seems to have been unoccupied for awhile or not thoroughly cleaned. One set of sheets looked to not being changed. Quiet and adequately furnished. Driveway not accessible for rental car, bottomed out. The Perfect Little Corner of Town! This location was ideal, as we were able to walk into town and enjoy everything Raglan has to offer, with the added bonus of coming home to a quiet street. Sharron gave us plenty of privacy and was a pleasure to meet. We would highly recommend the estuary walk at the bottom of the street. Thank you for your comments. I am glad you enjoyed all Raglan had to offer. Also thank you for leaving the unit in a very clean state. Great place to stay, close to town. And to lovely walk around the estuary. Private, Well equipped. Lovely place to stay, handy to plenty of activities or perfect just to chill out. Nice outdoor space. Private, quiet and worked well for our family group. Hostess welcoming and available but also gave us space. Appreciated use of umbrellas for beach trips! Thank you for your comments. Always nice to hear people have enjoyed themselves,especially when they leave the unit in good nick.Thank you. Very cosy property, was on a yoga retreat so ideal for this purpose. Very cosy property, was on a yoga retreat so ideal for this purpose. Plenty of hot water, good facilities and comfy beds. A pleasant, cozy and clean place. A pleasant, cozy and clean place. Even though the place is linked to the owner's house, Sharon gives you maximum privacy which was much appreciated. Highly recommended place to stay for a holiday. The bach is in a lovely location looking out onto a lovely garden. The bach is in a lovely location looking out onto a lovely garden. Nice quiet location.